I may have mentioned it before, but I'm in a friend's wedding later this year. It's actually my little sister from my sorority. A couple of her childhood best friends are throwing her a "Stock the Bar " shower in a few weeks, and I'm so excited because it's the first shower. If you've never heard of a "Stock the Bar" shower before you need to come out from under the rock where you've been living , they are seriously the cutest idea. It's a co-ed shower for the couple where everyone brings things to stock their home bar. So obviously you bring some kind of alcohol, but you also bring something extra. This can be a little tricky because unlike traditional showers, you aren't shopping from a registry of items you know the couple wants. But this little challenge can also mean more fun because you have the extra freedom to shop where you want to shop. 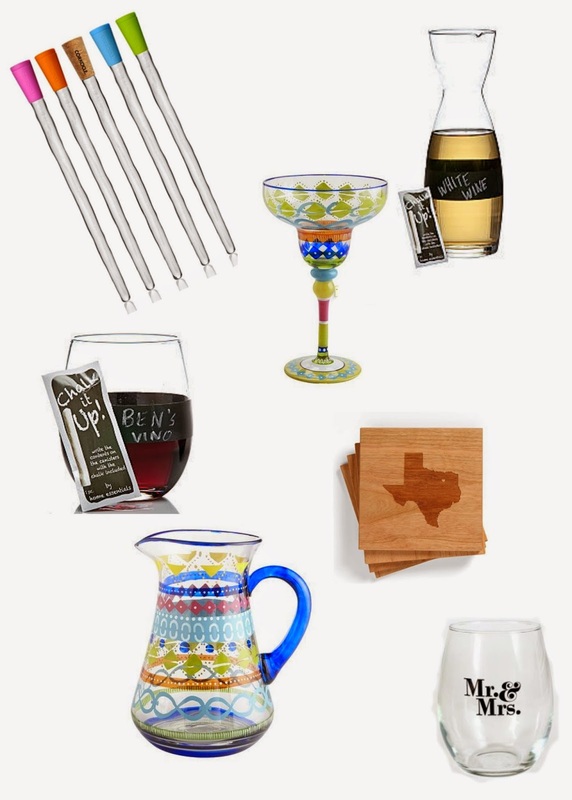 Plus let's be real, who doesn't love buying bar accessories. I've put together a little assortment of items that I think would be great to bring if you're invited to one of these showers. Have you ever been to a Stock the Bar shower? What'd you bring? side note: when I went to the liquor store to buy part of the gift the guy working told me I was too pretty to drink Jose Cuervo. Should I have been offended that he thinks I have terrible taste or flattered that he thought I was pretty? I was too thrown off by his comment to ask him plus it was about to storm and I needed to get back to my car before I had to figure out how to hold an umbrella and 2 paper bags full of alcohol. He was kinda cute though so I guess I'll just have to go back and ask next time. I'm confused at his comment, but yolo just take it as a compliment! haha. I've never heard of this type of shower (is that weird?) - but I LOVE the idea!! And I would take it as a compliment! I'm sure he didn't mean for it to sound as weird as it did hahah!